The amount of applications, tweaks and tips released for Google's first web browser Chrome is increasing daily which can be somewhat attributed to the media coverage it received during the launch phase. The attention it receives is still surprising if you consider its mediocre market share of sub 1% of the browser market even with Google advertising it prominently on the main page of its well-frequented search engine. 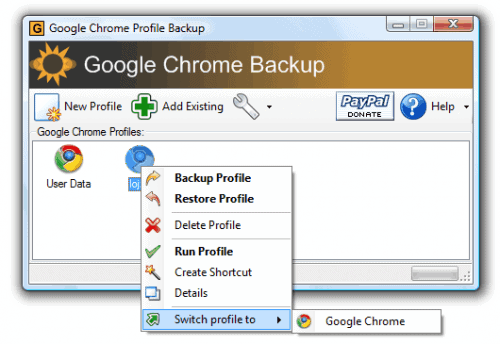 Google Chrome Backup is a tool that can backup, create, restore and delete Google Chrome profiles. A profile contains all the personal information of a user including bookmarks, the browsing history and the layout of the browser. It is actually no problem to backup Google Chrome profiles manually by copying all files stored in the Documents and Settings\username\Local Settings\Application Data\Chromium\User Data folders to another location. Google Chrome Backup on the other hand provides an easier method of backing up those files, as you only need to click a button in the program interface to do so without having to find and browse to the folder on the system manually. 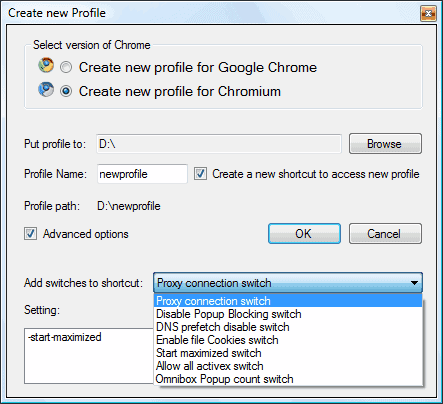 One interesting aspect of Google Chrome Backup is that it can also create profiles for the browser. Those profiles can be enhanced with startup parameters like starting the browser maximized, disabling the popup blocker or enabling file cookies. Google Chrome Backup is a nice backup tool to create backups of Google Chrome profiles. For those wondering about the difference between Google Chrome and Chromium. That's a bit confusing but it seems that Chromium is the Open Source version of Google Chrome. In other words, Google Chrome uses Chromium as its source, but receives additional features by Google that do not land in Chromium. Update: Please note that Google Chrome Backup has not been updated since 2009. While it may still work, it is highly suggested not to use the program for backups anymore as it may miss any data that Google has added after the last program update. Update 2: Another option that you have is to use the built-in synchronization. While that requires a Google account to work, it will have the effect that all personalized bits of data are synced to a remote server, so that you can use them on any device that you connect to the same Google account. but Martin how I can get this soft?